This bright and refreshing dip is quick and easy to make, requires only three ingredients, and can be used in a variety of ways. I have a really quick and easy recipe for you today. 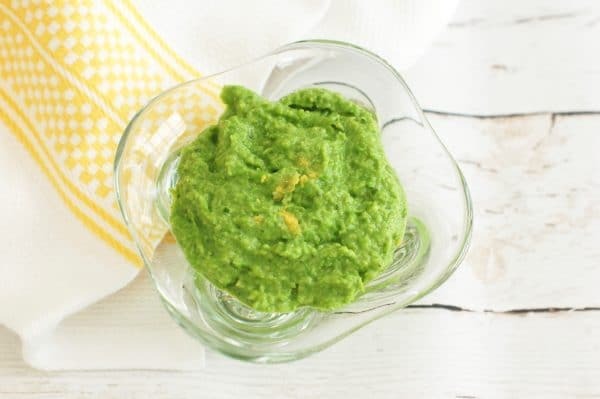 This 3-Ingredient Minty Pea Dip probably falls within the top 5 easiest recipes you will ever make. I promise! So let’s get to it, shall we?! Some people are turned off by peas because it reminds them of their childhood and being forced to eat whatever was on their plate. For many years I wasn’t so into peas either, but as I mentioned in my post about my Spring Pea & Radish Farro Salad, I have a newfound love of sweet peas, especially when they’re in season in the spring. Fresh pea season is basically over, although you may still be able to find some shelled peas in the refrigerator section at Trader Joe’s (I just saw some there yesterday, but it’s hit or miss) – but that shouldn’t stop you for making this Minty Pea Dip before the summer is over. You can easily use frozen peas to make this recipe, and if you do you’ll even shave an extra couple of minutes off the prep time. When using fresh peas, I like to blanch the peas before pureeing. The blanching process – cooking for a minute in boiling water and then shocking in an ice bath – brings out the sweetness and green color of the peas and softens them up a little bit. If I’m using frozen peas I take the bag of peas out the night before and thaw it in the refrigerator. Then all I have to do is add them to the food processor – no blanching required. In addition to saving those extra few minutes, the defrosted peas also make the dip nice and chilled, which is perfect for the hot summer days we’ve been having. Now, let’s talk for a minute about this being a 3-ingredient recipe. I have mentioned before that I don’t include salt and pepper in my count of ingredients. Not sure if you agree, but that’s my feeling and I’m sticking with it. So all you need for this recipe is a bag of peas, mint, and a lemon. You should have kosher salt in your kitchen already, and if you don’t we’ll have to discuss that separately. 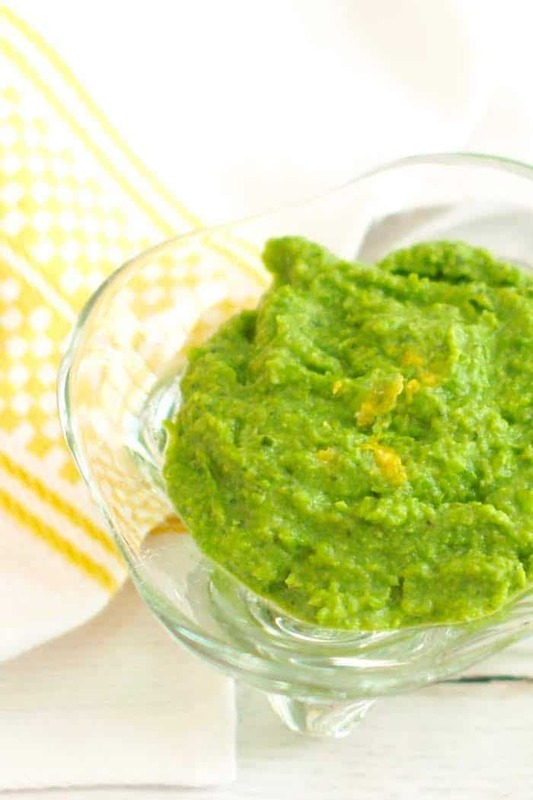 One last thing before the recipe – ways to use this Minty Pea Dip. I recently served it at a barbecue along with olives, hummus, and my watermelon salsa and a basket full of tortilla chips and a variety of whole grain crackers. Everyone loved it. Here’s some ways you can take it to the next level. Make a pea crostini by spreading it on lightly oiled and toasted slices of baguette. Add a dollop of ricotta cheese to take it up a notch more. Treat this dip as a pesto and toss it with pasta or ravioli. Use it as a sandwich spread paired with slices of mozzarella and tomato or a piece of grilled chicken. No matter how you use it, you will enjoy. Remember, I promised! This bright and refreshing dip is quick and easy to make, requires only three ingredients, and can be used in a variety of ways. Vegan, vegetarian, dairy-free, and gluten-free. If using fresh peas: Bring a small pot of water to boil, add the peas and cook for 1 minutes. Strain and plunge into an ice bath to stop cooking. If using frozen peas: Defrost peas overnight in refrigerator. 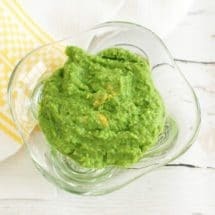 Place blanched or defrosted peas in a small food processor with mint, lemon zest and juice. Puree until smooth. Season with salt and pepper. Serve immediately or cover with saran wrap and refrigerate until ready to serve. 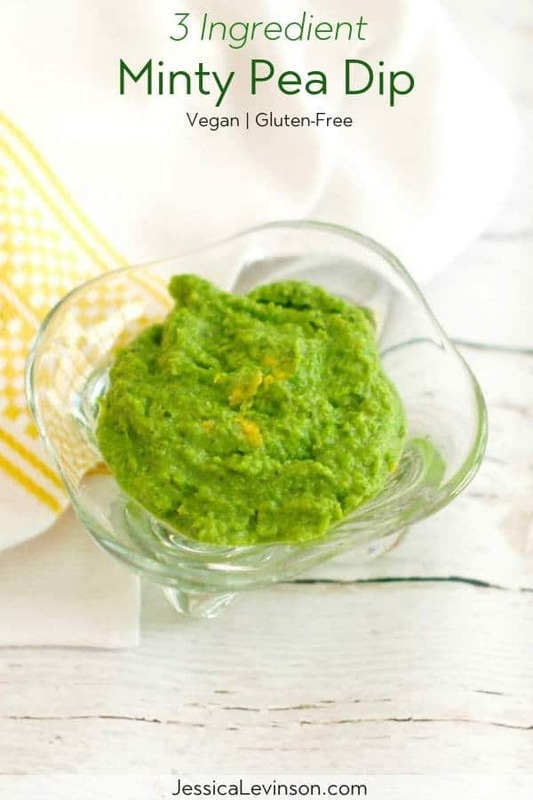 How would you enjoy this Minty Pea Dip? This recipe is a great way for me to test if I like peas or not. I haven’t had them in EONS so I honestly don’t even remember! Ha! Haha…I hope you like them! I didn’t for a while, but now I’m back into them – as long as they’re not overcooked and mushy! I love that salt and pepper don’t count as ingredients, pretty sure Sara Haas would agree with you!!! I didn’t know that about blanching peas, I’ll have to try it! Haha..I also don’t count olive oil! Hope you give it a try and enjoy! This is such a fresh and vibrant dish! It really doesn’t get better than this! Thanks Sonali! I just love simple recipes like this!! This sounds so tasty! 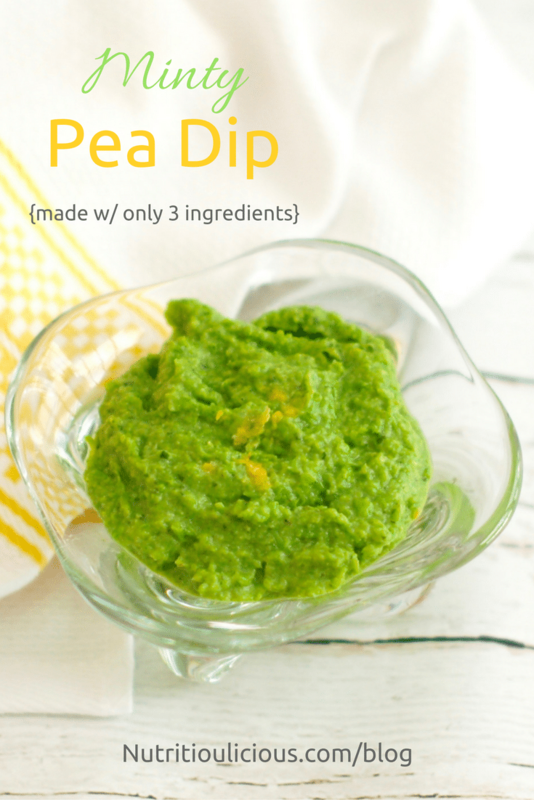 I’m generally not a pea fan, but I bet combined with the mint & lemon it would be amazing in a dip like this. Thanks Chrissy! I wasn’t a pea fan for a long time, but this is one of my favorite ways to use them. Hope you give it a try! Yum! What a fantastic idea! I have to make this! I always have a type of beans or chickpeas in my dips but these peas work beautifully! Thanks so much laurina! I was actually considering adding chickpeas to the recipe for a protein and fiber boost, but I wanted to keep it as simple as possible. You could definitely add them though and I’m sure it would be delicious! I love the idea of using this on a caprese sandwich with chicken, mozz and tomatoes! Looks so refreshing! It’s such a delish combo! Hope you enjoy! Looks delicious! I’ve been eyeing this toast on Instagram. Thanks Sarah! It’s so easy! I love the idea of using it as a pesto! This is such a simple recipe. Definitely will be using during those busy weeknights. Thanks Abbey! Hope you enjoy it! Thanks Christina – it’s great with crudite, especially jicama! What a creative way to use peas! I’ve never put them in a dip before! I’d love this with pita! Thanks Angela! LMK how you like it! Wow! This looks really interesting. Not a big mint fan but willing to try this out. Thanks Mikki. You can easily leave the mint out and just make it a pea dip, I just happen to love the combo of mint and peas together! I feel like a lot of people say that too! Hope you give this a try! Hope you like it Maria! Yum! I love a quick and simple snack! This looks amazing! Thanks Kristina! It’s super refreshing on hot summer days too! This is DELICIOUS!!! Will definitely be my go-to recipe for minty-pea. Serving size should be two, not three-LOL!!! Glad to hear you enjoyed it Andrew!